The Canadian Pacific Railway (CPR) completed its main line through Manitoba in 1883. Within a few years branch lines were needed to serve the growing farming communities. In 1898 a line was constructed into the Pembina Hills and a station located at La Rivière. The CPR, like other railway companies, systematically located its stations at key points on the line, typically at seven mile (12 kilometre) intervals. This was the distance a farmer could be expected to haul a wagonload of grain with a team of oxen or horses in a one day trip. By the turn of the century La Rivière had grown into a significant grain distribution centre. To accommodate a growing grain transportation need and an adjacent brickyard, the complex was enlarged in 1908 with a roundhouse, which was demolished in the 1960s, and a pump house. The CPR also used a system of standardized designs for all of its buildings. "First Class" stations, large and of unique design, were placed at the most important points, while "Third Class" stations, were located in modestly-sized distribution centres like La Rivière. Whether of grand size and design, or more modest, stations were intended to be attractive and impressive first stops in the Province’s new communities. 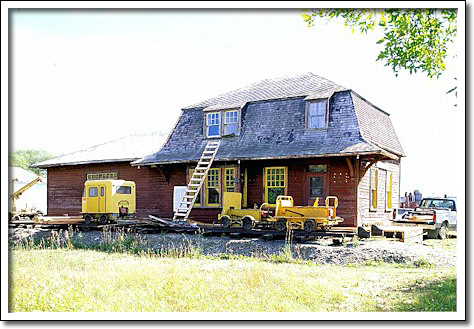 This station is the only remaining example in Manitoba of one standardized design, distinguished by a mansard roof, a feature of French derivation popular in the Province between 1880 and 1890.